The San Jose Hawks got a superb performance from designated hitter Guang Miao. Still, it wasn't enough to beat Montana . The Pandas won the game, 7-6. In spite of the loss, Miao was named the player of the game. He went 4-4 with a double and 3 singles. He drove in 2 runs and scored once. The winner was Montana reliever Jim Daniel, now 1-0. The loser was Guillermo Quiñones. Even with the win, the Pandas have a dismal 17-54 record. António Vargas was the walk-off hero for Montana . 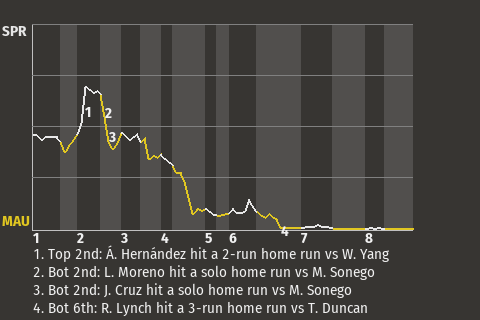 With the game tied in the bottom of the ninth inning, the Pandas center fielder hit a dramatic run-scoring single to send the teams home. "Honestly, I'm not frustrated," said San Jose manager Lonnie Wilder. "The effort was great."